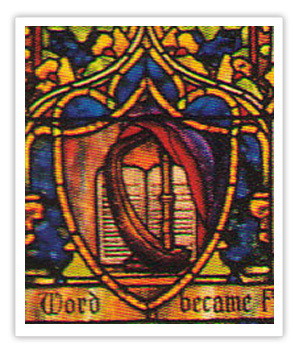 The Advent window, executed by Tiffany, was given by Mrs. J. M. High. This window honors her daughter, mother, and grandmother. In 1898 Mrs. High was one of the prime movers of the new North Avenue Presbyterian Church, “far out” on the edge of town. We have found no evidence that she ever returned to FPC. Mrs. High made many contributions to FPC and Atlanta as did many of those who are responsible for our windows. Her name is immortalized in the High Museum, which was once her home and stands next to our church. The museum was founded in 1905 as the Atlanta Art Association. In 1926, the High family, for whom the museum is named, donated their family home for the museum. The scene at the bottom contains symbols of the three elements that are central to the preceding window: first the outline of the harp representing David is in the center; second the two stones with the Ten Commandments representing Moses; third around the stones is a red mantle representing the prophets. 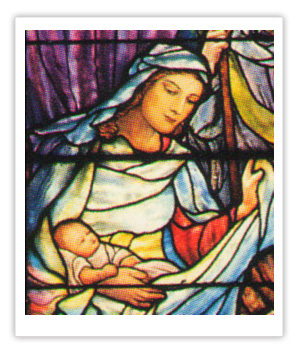 The large center panel shows the Baby in Mary’s arms in the stable, with Joseph in the background leaning on his crook, looking with great reverence on Jesus. At their feet is a worshiper bringing gifts. The little lamb at the bottom is indicative of the fact that the scene is in a stable. On the left the Wise Men arrive from the East bearing gifts. On the right, shepherds, who were the first to hear the Glad News, watch the scene. They are presenting the lamb they bring with them. Here we have Jewish and Gentile people all coming to worship Jesus Christ, reminding us that the New Testament is largely written by Jews, and Christianity was first a Jewish religion. Near the top of the center panel is the star of Bethlehem. Trouble with the artists in picturing the infant Jesus, they insisted on representing him as a little, mature old man sitting on Mary’s knee, and preaching, performing miracles etc. I explained to them that the child Jesus must be represented as a normal little babe, resting in His Mother’s arm. They all took great pains to paint little, mature men! I told Mr Tiffany that I would have to advise the donor of the window to cancel the contract etc. They renewed their frenzied efforts to sketch an infant child Jesus; but all failed again. Finally, I suggested to Mr Tiffany that he send two or three artists to a lying in hospital, and ask a nurse to let them see a recently born babe for a model. There was a chorus of “Ah! That is great!” And without further ado they sketched several very lovely and appropriate baby pictures! Just as Dr. Lyons and Tiffany’s artists struggled to depict Jesus’ face in this scene, so have we for 2000 years sought to embrace and understand the meaning of Jesus’ identity. The story of working with the Tiffany artists to achieve a representation of the Baby Jesus which looks like a young baby is told in the text with the window. 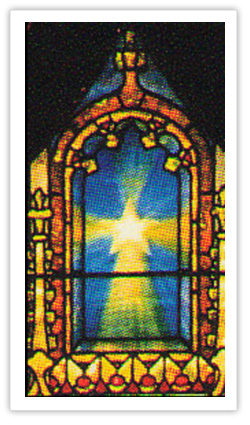 The symbol near the top of the center panel pf the trefoil is the star of Bethlehem.